If your morning commute takes you west through Beverly Hills, you might want to reconsider using Santa Monica Boulevard. 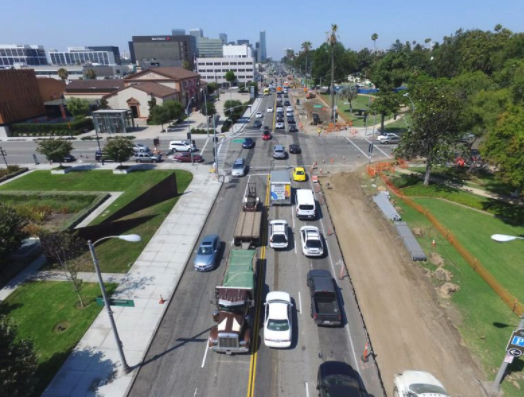 As part of its Santa Monica Boulevard reconstruction project, the City of Beverly Hills will leave only two westbound lanes open from today through Jan. 31. 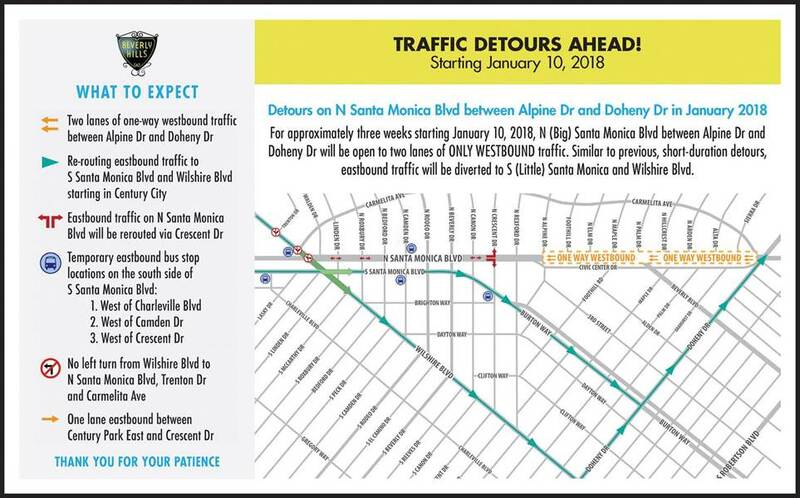 Eastbound lanes will be closed at Crescent Drive in Beverly Hills and traffic will be routed to South Santa Monica Boulevard (also known as Little Santa Monica Boulevard). The lane closures are because of construction activity that includes removing and replacing the road and its subgrade. That work will take place Monday through Friday from 8 a.m. to 6 p.m. and then from 8 p.m. to 6 a.m. The project will reconstruct a segment (approximately 1.5 miles) of Santa Monica Boulevard extending from Wilshire Boulevard to Doheny Drive in the City of Beverly Hills. The project will rebuild the deteriorating roadway; upgrade the storm drain system, replace curb and gutters; upgrade access ramps to American with Disability Access (ADA) standards, and install new LED street lights. Enhancements to the roadway include the installation of a bioswale on the north side. A bioswale is landscaping that concentrates or removes silt and pollution from surface runoff water. It also will include landscaping improvements and widening the south side between Canon Drive and Wilshire Boulevard. JJ, that appears to be the case. I had heard there will be a bike lane after all…any confirmation on that?